We love Hoodie, and working on this project has had a huge impact on us. Hoodie has made us think about the web, the way we build it and where we want it to go in the future, and Hoodie aligns with initiatives which are now as much a part of it as Hoodie is part of them. The work on Hoodie also inspired us to build tools which we’re now using to coordinate our work on it — to stay in touch with our community, attract new contributors and give everyone interested an overview of what we’re doing. All of these initiatives and tools have become near and dear to us as individuals, and they’re now also an important part of Hoodie. We live in a disconnected and battery powered world, but our technology and best practices are a leftover from the always connected & steadily powered past. We can’t keep building apps with the desktop mindset of permanent, fast connectivity in mind, where a temporary disconnection or slow service is regarded as a problem and communicated to the user as an error. Instead, we need to embrace being offline as a recurring state and offer UI, UX and architecture solutions that are built with this mindset. Started in November 2013 with this blog post, this initiative aims to start a discussion about mobile and offline first app development that goes beyond shrinking content to phone and tablet screen sizes. 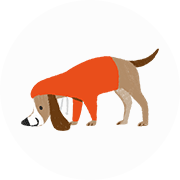 Offline First is built into Hoodie by default: Hoodie’s API decouples the client and the server in the store process so it can get interrupted or stop at any stage without breaking. Thus, users can keep working without interruption and without having to fear data loss. It enables you to build incredibly fast apps with zero latency and better apps with higher conversion rates. Find more information on the Offline First Website and in these Discussions. Aside from the initial blog post, there are more writings about Offline First, e.g. Offline First and the Circle of Web and Offline First and the Circle of Web: Breaking the Circle. "The real skill of creating a compelling and engaging view of the future lies not in designing the gloss, but in seeing beyond the gloss to the truths behind it." There was a time when app development was dictated by the backend - when building any application was almost entirely impossible without thinking (and, yes, sometimes worrying) about its backend. noBackend is an initiative that aims to enable everyone to turn smart ideas into elegant apps, without being torn apart by worrying about backends. This allows frontend developers to focus on user experience and gives backend developers more flexibility on the implementation side. It ultimately leads to backends that can be used out of the box, like Hoodie, remoteStorage or other examples, empowering frontend developers to build entire apps without even thinking about backend at all. Find more information on the noBackend Website and on Twitter. "Backends are hard, they're made up of a lot of different components that all have to interact with each other, there's a variety of languages and syntax in even the simplest setup and far more. And that's before you start scaling." The core of Open Source Software projects is usually code, and work on community expansion and attracting new contributors has most often been a synonym for getting new developers on board. Still, there’s so much more that can be done in Open Source: starting with writing documentation, submitting bug reports, writing content for a website or blog to design, event organisation and much more. This small initiative, started off with two blog posts about the relevance of non-coders in Open Source and how to attract them, aims to raise awareness for the relevance of non-coders and give practical advice on how to attract and keep them happy in these projects. "The Open Source Community that embraces designers, writers and other experts most, wins." Hoodie’s API is Dreamcode, and this means: its API is optimized for being awesome. It’s optimized for making the lives of frontend developers as good and easy as possible by providing well-understandable and -readable code. Essentially, Dreamcode means that you dream up the code you would like to write, and work backwards from there. Thus, Hoodie’s code is easy to write and easy to read. It’s the code of your dreams! … and one of the reasons why Hoodie exists. Hoodie is also an API first: it’s a promise. This is what makes noBackend possible. Everything else like Hoodie’s implementation may change and improve over time, but the interface provided to developers will always remain the same, so that you won’t ever have to worry about it. This GitHub-API-backed Milestone app was born in a time of slight confusion: we knew there was so much to do, we knew we had too little time, and we knew we wanted to get things done. But we didn’t know where to start. Thus, over one weekend, we built this app. It shows an overview of the Hoodie Roadmap — all features we want to build, what we want to deliver the community and what it will enable people to do. It’s quite high-level, but it helps us a lot keep track of Hoodie’s progress on a daily basis, see what everyone is working on, which to dos we can point out to prospective contributors and give an impression to Hoodie’s progress to everyone. 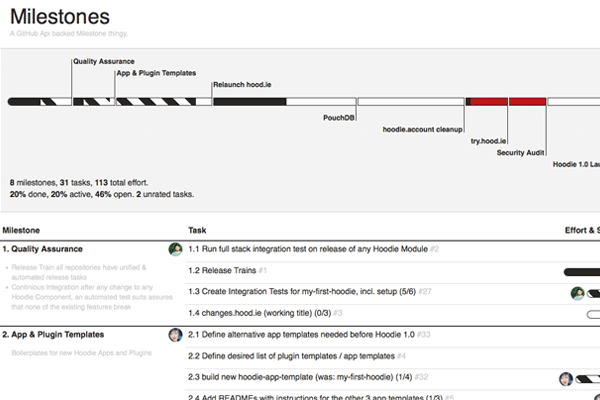 The Hoodie Milestones app can be seen here and it’s on GitHub. A collective team hack on a sunny thursday afternoon, based on the idea of showing all recent accomplishments and open to dos in one interface: this is Ubersicht. We built it to give people a place to go when they just wanted to code on something, including the option to filter the items based on their individual skills and needs. Ubersicht for Hoodie is here and it’s on GitHub. Our FAQ is a nice little app to provide useful knowledge to a broader amount of people and make it easy for everyone to add new questions and answers. 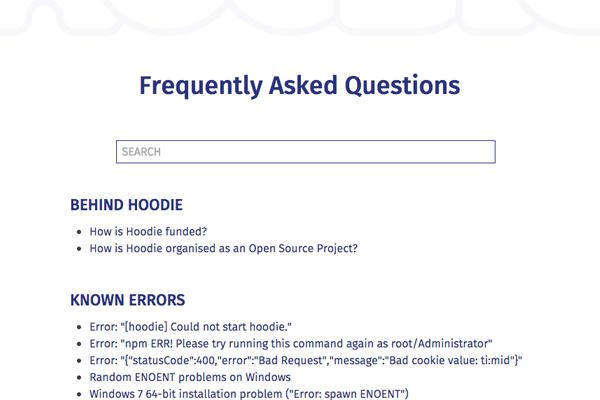 The Hoodie FAQ app is here and it’s on Github. 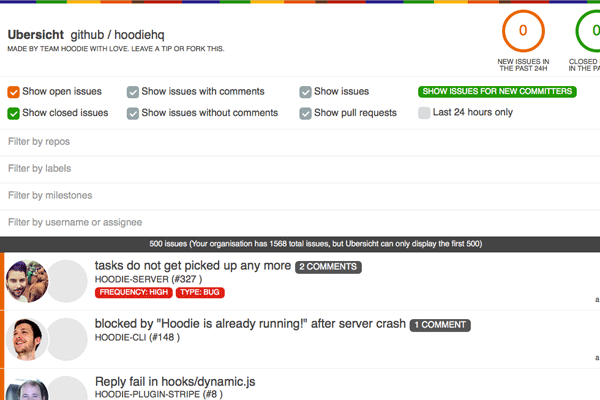 You’ll find more apps some of our community members or our friends built based on Hoodie here.